Chief complaint: Abdominal pain and weight loss for 3 months. History of present illness: A 53-year-old white man with a history of hyperlipidemia treated with atorva statin originally presented in 2007 to the emergency department with worsening constipation, abdominal pain, and a 20-lb weight loss. Given concerns about diverticular disease or colon cancer, computed tomography (CT) imaging was done that showed a 6-cm small bowel mass with evidence of partial small bowel obstruction. No other masses were visible on CT imaging. The patient underwent surgical resection. Path ology revealed a gastrointestinal stromal tumor (GIST) with spindle cell morphology, dimensions of 6 cm x 4 cm x 3 cm with 12 mitotic figures per 50 high power fields. Given the primary site, tumor size, and mitotic rate, the patient was believed to have an 85% risk of recurrent disease. At the time of his diagnosis, there were no published data regarding adjuvant therapy, and the patient was monitored clinically for recurrence. Three years after resection, the patient presented to his primary care provider with abdominal bloating and fatigue. Lab oratory tests revealed worsening iron deficiency anemia. Repeat CT scan showed multiple peritoneal implants; the largest measured 2 cm x 2 cm. A CT-guided biopsy was performed, with pathology consistent with GIST. At that time, mutational testing was performed on the patient’s original surgical tumor specimen, which showed a KIT exon 9 mutation. He was started on standard-dose imatinib (400 mg/day), and then after 1 month of treatment, his imatinib dose was increased to 400 mg twice daily. 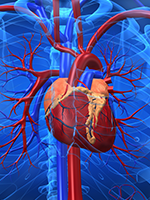 Given the interaction between imatinib and atorvastatin, the patient was changed to pravastatin. In addition, the patient was advised to discontinue use of St. John’s wort. The patient was also treated for iron deficiency anemia. Six months later, repeat CT imaging showed decreased size of all peritoneal masses, the largest now 1.0 cm x 0.8 cm. Medical history: Hyperlipidemia; mild depression treated with St. John’s wort. Surgical history: Tonsillectomy, 1965; small bowel resection, 2007. Family history: Mother: 75 years old with diabetes and hypertension. Father: deceased at age 45 in motor vehicle accident. Paternal uncle: colon cancer at 72. No other family history of cancer. Social history: Patient is divorced with two grown children. He works as a foreman at a construction site. He quit smoking 30 years ago, with a 10 pack-year history. He drinks 1 to 2 drinks per week and occasionally smokes marijuana. Medications: Pravastatin, 40 mg by mouth daily; aspirin, 81 mg by mouth daily; daily multivitamin. Physical examination: General: Overweight man who appears older than stated age, well groomed in no acute distress. Vital signs: Temperature: 98.1°F; heart rate: 93 bpm; blood pressure: 134/86 mm Hg; oxygen saturation: 98% on room air; height: 70 inches; weight: 100 kg. Head, ears, eyes, nose, throat: Pupils equal, round, reactive to light; conjunctiva pale, no sclera icterus; mucous membranes moist. Neck: Soft, supple; no appreciated jugular venous distension; no cervical, supraclavicular or infraclavicular lymphadenopathy. Respiratory: Clear to auscultation bilaterally; no wheezing, rhonchi, or rales. Cardiovascular: Regular rate and rhythm; no murmur, rubs, or gallops noted. Abdomen: Well-healed midline laparotomy scar noted; normoactive bowel sounds; distended ab domen; no fluid wave appreciated; no tenderness to palpation noted. Extremities: Trace bilateral edema to ankles. 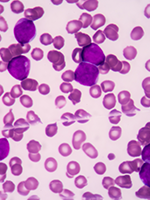 Overall, imatinib has revolutionized the treatment of GIST, as it has for treatment of chronic myeloid leukemia (CML). For most patients, imatinib 400 mg once daily is the optimal dose (Figure). However, in patients with KIT exon 9–mutant tumors, data support a target dose of 400 mg twice daily. These dosing recommendations have re cently been incorporated into the National Comprehensive Cancer Network clinical practice guidelines for GIST.16 Based on these guidelines, our patient was started on imatinib 400 mg once daily to assess drug tolerance and then underwent dose escalation to 400 mg twice daily after his first month of therapy. Notable findings in this patient were iron deficiency and anemia. Iron deficiency is a common finding in GIST patients and usually a consequence of bleeding from the primary tumor. The patient’s anemia is likely due to his iron deficiency, although an element of anemia of chronic disease and/or imatinib-induced myelosuppression also could exist. It is important to recognize and treat iron deficiency in GIST patients, as anemia is a common side effect of imatinib treatment. Patients with metastatic GIST and uncorrected iron deficiency anemia may experience severe anemia and fatigue during imatinib treatment. It is important to recognize that oral iron replacement may not be effective in patients with previous total/subtotal gastrectomy or patients treated with proton pump inhibitors, because an acidic environment is required for iron absorption. The initial visit to an oncologist can be a stressful experience. Hearing about one’s cancer diagnosis, assimilating prognosis, treat ment plans, and follow-up care can be emotionally over whelming. Timing of the first ap pointment is critical to the start of treatment but the patient may still be in shock. This shock can be lessened by the oncology nurse specialist. The oncology nurse should assess the patient and care partner’s learning style and educational needs in order to offer appropriate information related to the disease process and treatment plan. If the treatment plan contains oral targeted cancer treatment such as imatinib, the nurse hopes to instill trust and empower the patient to be an active partner in the treatment of their disease. Patients should have easy written access to the clinic phone number to report all side effects and receive reliable phone triage of their symptoms and reported side effects of therapy. The patient’s imatinib prescription will be written by the physician. An important role of the oncology nurse is to help guide the patient through the maze of insurance authorizations, copays, mail-order pharmacies, and patient-assistance programs. Again, this partnership with the patient instills trust and opens the patient to active participation in his or her care. Health literacy screening at the onset of therapy and ongoing follow-up is necessary to remove any barriers the patient may have to achieving good medication adherence. Nurses can provide practical tools such as calendars, electronic reminders, and enlisting phone calls from family and friends to ensure adherence to the treatment regimen. By enlisting patients as partners, the oncology nurse, in partnership with the oncology pharmacist, hopes to empower them to learn, question, and report side effects. Each patient should have a planned drug supply (these are expensive medications), guidance for managing side effects, a list of which side effects require prompt follow-up, phone numbers to call, and a plan to integrate this medication into everyday life to improve patient quality of life and to maintain lifestyle expectations. Imatinib can also cause bone marrow suppression or have adverse effects on liver enzymes. Patients should expect frequent lab draws to monitor blood counts and liver tests. The nurse should be a partner in explaining the blood test results and the meaning of the values to help patients understand this complex assessment tool. As will be discussed, patients should understand that oral targeted therapies may interact with other medications they are taking. Patients should be encouraged to disclose all their prescribed and complementary medications. As partners in therapy, patients should know that becoming pregnant or fathering a child while taking imatinib is not advised. Open discussion of sexuality is always encouraged. The management of patients being treated for GIST is complicated and requires a multidisciplinary approach. The role of the nurse is pivotal in patient education, side-effect management, and ongoing patient support. The oncology pharmacist should interact with the patient on a variety of levels to increase medication understanding, safety, and success with imatinib therapy. Not a bly, careful review of drug–drug inter actions between imatinib and other agents is a com mon and im port ant area of focus for on cology pharmacists. In vivo, imatinib is a strong, competitive inhibitor of CYP3A4 and CYP2C9 and a relatively weak inhibitor of CYP2D6. Imatinib is metabolized pri marily by CYP3A4, with minor contributions from CYP1A2, CYP2D6, CYP2C9, and CYP2C19.21 Thus, imatinib is not only affected by CYP3A4 inducers and inhibitors, but it also inhibits the metabolism of other drugs metabolized by CYP3A4. Al though many agents are metabolized via the CYP enzyme systems, these interactions are critically important when the affected medication has a narrow therapeutic margin, is metabolically affected to a large degree, or is a critical element of patient care (Table). In this case, our patient was taking St. John’s wort, a dietary supplement sometimes used for managing mild depression and a known potent inducer of multiple enzyme systems. In a drug interaction study in 12 healthy volunteers, those taking St. John’s wort had a 43% reduction in the imatinib area under the curve (AUC) from baseline.24 This magnitude of change could significantly diminish the clinical response in our patient. Other potent inducers (Table) have been shown to affect imatinib to a similar or greater degree and should be avoided when possible. If the inducing agents cannot be avoided, then the dose of imatinib may need to be adjusted upward, but there are no clear guidelines for this situation. In this case, the St. John’s wort was discontinued because its clinical benefits were uncertain. The patient also was cautioned to have any additional dietary supplements being contemplated for use reviewed by the team, because there are multiple agents known to modify CYP activity. With respect to imatinib’s effects on other agents, atorvastatin is a CYP3A4 substrate and imatinib in creases the blood levels of a similarly metabolized statin, simvastatin, by 2 to 3.5-fold. This degree of increased drug exposure can significantly increase the risk for side effects, such as myalgias, hepatotoxicity, and rhabdomyolysis.26 In the current case, we substituted pravastatin for atorvastatin. This agent is expected to provide similar antilipid benefits, but is only a minor CYP substrate. It is important for the GIST patient care team, especially the oncology pharmacist, to review each medication or nutritional supplement in the patient’s medication list for potential drug–drug interactions and/or overlapping side effects. Many other medications can be similarly affected, because CYP3A4 is among the most common pathways used for medication metabolism. Medications with narrow therapeutic margins, where small changes in blood level can cause profound physiologic effects, are the most concerning when reviewing for drug interactions. For example, although imatinib inhibition of CYP2C9 is not as significant as its effects on CYP3A4, CYP2C9 is the primary enzyme that metabolizes warfarin. Imatinib treatment can inhibit CYP2C9 sufficiently to decrease warfarin metabolism and cause patients to become excessively anticoagulated and at increased risk for bleeding events. Each medication or supplement that a patient is receiving should be reviewed in a similar manner to look for common CYP substrates (Table) and to assess the risk of interaction or overlapping side effects. Patients should be advised to contact the oncology care team whenever any change in medication profile is considered (including both adding and subtracting medications). The introduction of TKIs has revolutionized the treatment of metastatic GIST. However, obtaining optimal treatment results requires a multidisciplinary approach by physicians, oncology nurses, and oncology pharmacists. In particular, patient education to ensure medical compliance, and successfully manage side effects and concomitant medications are critical elements for successful treatment of patients with GIST. Although this review has emphasized first-line treatment of metastatic GIST with imatinib, similar multidisciplinary coordination of care is required when using sunitinib for second-line treatment of metastatic GIST. Funding was provided in part by a Merit Review Grant from the Veterans Affairs Administration (MCH) as well as from the GIST Cancer Research Fund (MCH) and the Life Raft Group (MCH). All potential conflicts of interest have been reviewed and managed by Conflict of Interest Committees at the Portland VA Medical Center and the Oregon Health and Science University. DeMatteo RP, Heinrich MC, el-Rifai W, Demetri G. Clinical management of gastrointestinal stromal tumors: before and after STI-571. Hum Pathol. 2002;33:466-477. Gastrointestinal Stromal Tumor Meta-Analysis Group (MetaGIST). Comparison of two doses of imatinib for the treatment of unresectable or metastatic gastrointestinal stromal tumors: a meta-analysis of 1,640 patients. J Clin Oncol. 2010;28:1247-1253. Blanke CD, Demetri GD, von Mehren M, et al. Longterm results from a randomized phase II trial of standard-versus higher-dose imatinib mesylate for patients with unresectable or metastatic gastrointestinal stromal tu mors expressing KIT. J Clin Oncol. 2008;26:620-625. Verweij J, Casali PG, Zalcberg J, et al. Progression-free survival in gastrointestinal stromal tumours with high-dose imatinib: randomised trial. Lancet. 2004; 364:1127-1134. Hirota S, Isozaki K, Moriyama Y, et al. Gain-of-function mutations of c-kit in human gastrointestinal stromal tumors. Science. 1998;279:577-580. Heinrich MC, Corless CL, Duensing A, et al. PDGFRA activating mutations in gastrointestinal stromal tumors. Science. 2003;299:708-710. Heinrich MC, Griffith DJ, Druker BJ, et al. Inhibition of c-kit receptor tyrosine kinase activity by STI 571, a selective tyrosine kinase inhibitor. Blood. 2000;96:925-932. Joensuu H, Roberts PJ, Sarlomo-Rikala M, et al. Effect of the tyrosine kinase inhibitor STI571 in a patient with a metastatic gastrointestinal stromal tumor. N Engl J Med. 2001;344:1052-1056. Demetri GD, von Mehren M, Blanke CD, et al. Efficacy and safety of imatinib mesylate in advanced gastrointestinal stromal tumors. N Engl J Med. 2002;347: 472-480. Van Oosterom AT, Judson I, Verweij J, et al. STI571, an active drug in metastatic gastrointestinal stromal tumors (GIST) an EORTC phase I study. Proc Am Soc Clin Oncol. 2001;20(1A):Abstract 2. Van Oosterom AT, Judson I, Verweij J, et al; for the European Organisation for Research and Treatment of Cancer Soft Tissue and Bone Sarcoma Group. Safety and efficacy of imatinib (STI571) in metastatic gastrointestinal stromal tumours: a phase I study. Lancet. 2001; 358:1421-1423. Blanke CD, Rankin C, Demetri GD, et al. Phase III randomized, intergroup trial assessing imatinib mesylate at two dose levels in patients with unresectable or metastatic gastrointestinal stromal tumors expressing the kit receptor tyrosine kinase: S0033. J Clin Oncol. 2008; 26:626-632. Heinrich MC, Corless CL, Demetri GD, et al. Kinase mutations and imatinib response in patients with metastatic gastrointestinal stromal tumor. J Clin Oncol. 2003;21:4342-4349. Heinrich MC, Owzar K, Corless CL, et al. Cor relation of kinase genotype and clinical outcome in the North American Intergroup Phase III Trial of imatinib mesylate for treatment of advanced gastrointestinal stromal tumor: CALGB 150105 Study by Cancer and Leukemia Group B and Southwest Oncology Group. J Clin Oncol. 2008;26:5360-5367. Demetri GD, von Mehren M, Antonescu CR, et al. NCCN Task Force report: update on the management of patients with gastrointestinal stromal tumors. J Natl Compr Canc Netw. 2010;8(suppl 2):S1-S41. Miettinen M, Lasota J. Gastrointestinal stromal tu mors: pathology and prognosis at different sites. Semin Diagn Pathol. 2006;23:70-83. DeMatteo RP, Ballman KV, Antonescu CR, et al; for the American College of Surgeons Oncology Group (ACOSOG) Intergroup Adjuvant GIST Study Team. Adjuvant imatinib mesylate after resection of localised, primary gastrointestinal stromal tumour: a randomised, double-blind, placebocontrolled trial. Lancet. 2009; 373:1097-1104. Wu EQ, Johnson S, Beaulieu N, et al. Healthcare resource utilization and costs associated with non-adherence to imatinib treatment in chronic myeloid leukemia patients. Curr Med Res Opin. 2010;26:61-69. Joensuu H, Trent JC, Reichardt P. Practical management of tyrosine kinase inhibitor-associated side effects in GIST. Cancer Treat Rev. May 28, 2010. Epub ahead of print. Peng B, Lloyd P, Schran H. Clinical pharmacokinetics of imatinib. Clin Pharmacokinet. 2005;44:879-894. Lacy CF, Armstrong LL, Goldman MP. Drug Infor mation Handbook. Hudson, OH: Lexi-Comp, Inc; 2010. Therapeutic Research Faculty. Natural Medicines Comprehensive Database. http://naturaldatabase.therapeuticresearch.com/nd/products.aspx?AspxAutoDetectCookieSup port=1. Accessed October 6, 2010. Frye RF, Fitzgerald SM, Lagattuta TF, et al. Effect of St John’s wort on imatinib mesylate pharmacokinetics. Clin Pharmacol Ther. 2004;76:323-329. Dutreix C, Peng B, Mehring G, et al. Pharmaco kinetic interaction between ketoconazole and imatinib mesylate (Glivec) in healthy subjects. Cancer Chemother Pharmacol. 2004;54:290-294. O’Brien SG, Meinhardt P, Bond E, et al. Effects of imatinib mesylate (STI571, Glivec) on the pharmacokinetics of simvastatin, a cytochrome p450 3A4 substrate, in patients with chronic myeloid leukaemia. Br J Cancer. 2003;89:1855-1859.